The MBS Virtual Bookstore is open. 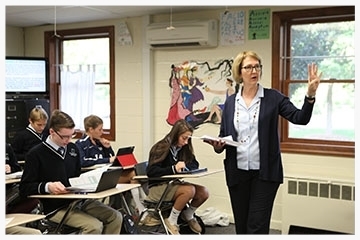 As a college preparatory school, St. Mary's Ryken and our faculty will prepare you not only for college, but for you to take your place in a world that is increasing global and continually changing. One of the programs that will help you as you prepare, is the SMR 1:1 iPad program. With the iPad, you will be able to access your textbooks, calendar, assignments and student portal. While many of the textbooks you will be using are eBooks for the iPad and available through the Apple Bookstore, there are still some books that are not available in electronic format. To find out which books you will need and to purchase, please visit the MBS Direct bookstore webpage. The MBS Virtual Bookstore is open to purchase books for the next school year. Orders over $50 will be eligible for free shipping in mid August. Updated information will be posted as soon as it is available. If you have questions about books, please contact Julie Bryner, Campus Store Manager: julie.bryner@smrhs.org or 301-373-4179.